From God’s words we can see those who don’t have true faith in God rely on their own will and good intentions to do things. And thus they can easily be Satan’s outlet interrupting and disturbing the work of God. God’s work is done by Himself and is unfathomable to man. Whether crucifixion comes upon the Lord Jesus is determined by the Lord: The Lord allows it to happen then it happens; the Lord doesn’t allow it to happen then it shall not happen. The occurrence, development and outcome of all the people, things and events are determined by God, not by man. Proverbs 3:6 In all your ways acknowledge him, and he shall direct your paths. 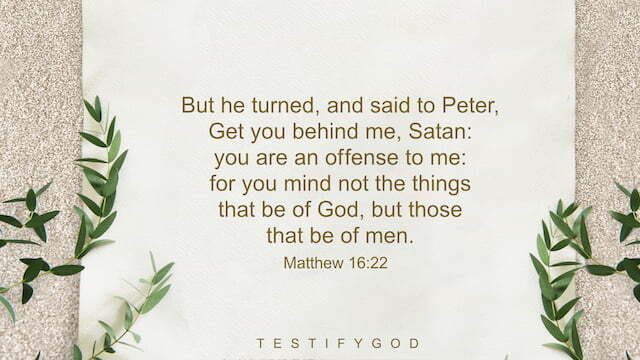 Reflection This verse shows us that we should rely on God in all things, and firmly believe that all things are in God’s hands and that only by obeying His orchestrations and arrangements can we have a way of practice. That is to say, instead of believing in God in one matter or two matters, we should firmly believe in God in all things. God is faithful and He will definitely show us the way of practice in every matter. For example, when David faced the Philistine giant Goliath, he said, “You come to me with a sword, and with a spear, and with a shield: but I come to you in the name of the LORD of hosts, the God of the armies of Israel, whom you have defied” (1 Samuel 17:45). By relying on God, David killed Goliath without a sword or a spear, but with only a stone. So, if we want to firmly believe in God in all things, we should not rely on our ability or intelligence to deal with everything we encounter. Instead, we should actively cooperate with God in all things. If we do not understand, we should completely rely on God, seek His will, wait for His guidance, and firmly believe that only God is our help. Just as God says, “You must enter in from the positive side. If you wait passively, it is still negative. You must be proactive in cooperating with Me; be diligent and never lazy. Always be in fellowship with Me and have deeper intimacy with Me. If you do not understand, do not be impatient for quick results. It’s not that I won’t tell you; I want to see if you rely on Me when you are in My presence and whether you depend on Me with confidence. You must always remain close to Me and place all matters in My hands. Do not go back in vain. After unknowingly being close to Me for a period of time, My intentions shall be revealed to you. If you grasp them, then you will truly be face-to-face with Me, and you will have truly found My face. You will be quite clear and steady within and you will have something to rely on, and you will also have power as well as confidence. You will also have a path forward and everything will come easy to you.” » Recommended for you: • Relying on God, I Got More Than a Job • Relying on God, I Easily Modify Well Creative Proposal • Bible Verses About Relying on God Peace be with you all! Dear brothers and sisters, if you have any understanding or enlightenment from God, you’re welcome to share with us.1. Via the online chat window at the bottom right corner of the screen.2. Send an email to info@testifygod.org.We sincerely hope we’ll grow spiritually through sharing with each other.